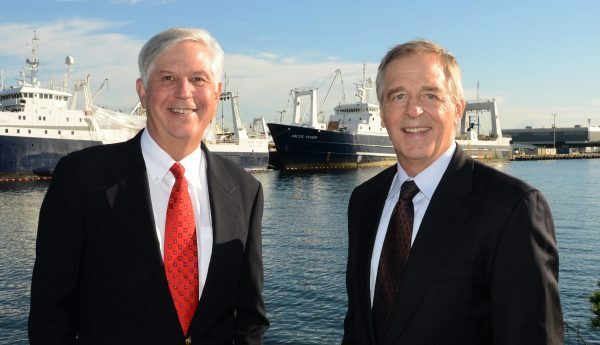 On March 9, 2017, in a landmark case handled by Stacey and Jacobsen, PLLC, the Washington State Supreme Court ruled unanimously that punitive damages may be awarded to injured fishermen and seamen when the case involves a general maritime unseaworthiness claim. Where an employer recklessly provides a vessel or equipment that is not reasonably fit, the employee may bring a separate additional claim of punitive damages. This ruling is a precedent setting victory for maritime workers throughout the nation. No other State Supreme Court has yet ruled on this issue. We are very pleased that employees now have an additional weapon in their arsenal to obtain justice and, at the same time, hopefully curtail dangerous conduct of shipowners. Allan Tabingo was a deckhand aboard F/V AMERICAN TRIUMPH when the accident occurred. After fish are brought aboard the vessel, a hatch is opened on the deck so that deckhands can shovel the fish through the hatch for processing. To move the last of the fish from the deck into the hatch, a deckhand must get down on all-fours and push the remaining fish through the hatch using their hands. Tabingo was on his knees gathering the fish when another deckhand began closing the hatch. The deckhand realized that Allan Tabingo’s hand was in danger, and tried to stop the hatch from closing. The handle on the hydraulic control valve was broken and repeatedly popped out of the valve. The hatch closed on Tabingo’s hand, severing two of his fingers. The vessel operator had been aware of the broken control handle for two years prior to the incident, yet failed to repair it. In fact, the crew tied one end of a piece of line around the handle and the other end to the ship’s rail so that when the handled popped out, it would not fall overboard. Alan Tabingo suffered the amputation of two fingers and the loss of his livelihood. Tabingo filed suit in King County Superior Court against the vessel operator, American Seafoods. He asserted Jones Act negligence and general maritime law unseaworthiness claims. The punitive damages claim was based on the precedent setting 2009 Supreme Court of the United States ruling in Atlantic Sounding v. Townsend. The trial judge decided that punitive damages did not apply and dismissed Tabingo’s claim. Tabingo appealed to the State of Washington Supreme Court. Two sailors arrived in Kodiak on Wednesday, September 28th, 2016 seeking medical treatment due to the sinking of the sailboat Rafiki. The men were sailing 230 miles south of Cold Bay, in 7 mph winds and 6-foot seas, when the engine compartment began to fill with water. 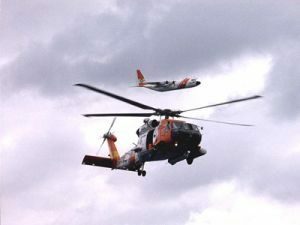 They contacted Coast Guard 14th District in Honolulu, who transferred the call to Coast Guard 17th District in Juneau. The Rising Sun, a nearby vessel, was diverted toward the Rafiki as backup. The sailors were instructed to activate and remain with their EPIRB (Emergency Position Indicating Radio Beacon), and with the vessel, until evacuation was absolutely necessary. A HC-130 Hercules long-range aircraft arrived promptly at the scene and dropped survival suits to the sailors, who were then rescued by a MH-60 Jayhawk helicopter for transport to Sand Point. There, the Hercules picked them up for transport to the hospital. At around 10:30 a.m. at Terminal 46 on Alaskan Way South, a loader overturned, trapping the 50-year-old driver inside the cab. Seattle Fire Department responded by 11:00 a.m. and after about 15 minutes, the rescue was successful. SFD reported that the man suffered minor injuries and was taken to Harborview Medical Center for evaluation and treatment. Fire Capt. Shata Stephenson did not know how the incident occurred, though the loader appeared to have overturned and hurled the vehicle’s cab into the air while lifting a heavy load. Coast Guard 17th District watchstanders received a call Monday morning from Health Force Partners to report the deteriorating medical condition of a crewmember aboard F/V UNIMAK. After consulting the duty flight surgeon, the Coast Guard directed the launch of a MH-65 Dolphin helicopter crew to the scene. The man had been experiencing abdominal pain, headaches, and a fever for several days. His worsening condition prompted an immediate medevac. He was hoisted and transported to emergency medical services in Dutch Harbor, Alaska. On the afternoon of Sunday, July 31, M/V BIG RED was traveling in Favorite Channel near Juneau, Alaska when it began taking on water. Watchstanders from coast Guard Sector Juneau received the distress call and issued an urgent marine information broadcast calling for assistance from nearby vessels. All persons aboard the 35-foot whale-watching vessel were rescued by Coast Guard and multiple Good Samaritan vessels. The 16 passengers and 2 crewmembers were transferred onto M/V ST. HERMAN with the help of recreational vessel See You, and transported to Allen Marine Dock to await Coast Guard and medical personnel. One knee injury was reported. Lt. Jennifer Ferreira, sector Juneau command duty officer, commended the BIG RED crew for their swift, decisive action to ensure that all passengers were handed life vests when the vessel began taking on water. John McMillen, who grew up in Chimacum, Washington, was honored on the M/V KENNEWICK as the ferry traveled between Port Townsend and Coupeville. McMillen was given the Life Ring award for his role in saving a man’s life earlier this month. On July 17th, McMillen used an automated external defibrillator on a 60-year old man who suffered a heart attack aboard a Bainbridge-bound ferry. The crew acted quickly to help the man, and the captain rerouted the ferry back towards Seattle. This effort allowed the man to receive medical attention an hour sooner than he would have if the ferry continued to Bainbridge. William Smith, 50, of Bangor, WA, drowned in a boating accident at Kitsap Naval Base in Bangor, WA on December 11, 2014. Smith worked on base for the subcontractor Homeland Security Solutions (HSSI), a professional training, technology, and services company supporting security needs. Investigations are ongoing to determine the cause and circumstances of Smith’s death. Mike McGuire, HSSI’s program manager, could not provide details until investigations by his firm and the Navy are complete. The Kitsap County Coroner’s Office confirmed that the cause of death was saltwater drowning. At 5:00 am on November 23, 2014, crew on the fishing vessel TWO MEGS called the New England Coast Guard in distress: the engine room was flooding. The boat was located 40 miles east of Isles of Shoals off the coast of Maine. By 6:40 am, a Coast Guard helicopter hovered over the boat and dropped down auxiliary pumps to dewater the engine room. A fisherman aboard RACHEL T acted as a Good Samaritan and assisted. The Coast Guard cutter GRAND ISLE arrived and towed TWO MEGS to Boston. Crew from the fishing vessel ROYAL FORTUNE called the Northern New England Coast Guard on Saturday afternoon, November 22, 2014, to report their boat was disabled and adrift in 12′ to 15′ seas off of Southwest Harbor, Maine. According to Operations Specialist First Class Chris Kiener, the Coast Guard decided to launch a 47-foot motor lifeboat to tow the ROYAL FORTUNE and three crewmembers to shore because of the wind and high seas. The tide was high on the East River as it flowed underneath New York City’s Brooklyn Bridge the evening of November 7, 2014. At about 10:30 pm, the 590 foot cargo ship RAINBOW QUEST headed down the East River on its way towards open sea. As the ship passed under the Brooklyn Bridge, its tallest mast clipped the bottom of the famous bridge linking Manhattan and Brooklyn. Coast Guard spokeswoman Ali Flockerzi said the Metropolitan Transportation Authority had already scheduled a routine closure of the bridge late Friday and inspected the span when it was closed. She said there was no damage to the bridge. Can you imagine the nightmare if the RAINBOW QUEST had caused extensive damage to the bridge and/or the ship? Any boat must know its height requirements and high tide information for passing under bridges. Luckily no one was injured and no damage was done.